Item: CVA 371-1491 - "Dedication of Cenotaph, Gibson's Landing, B.C. 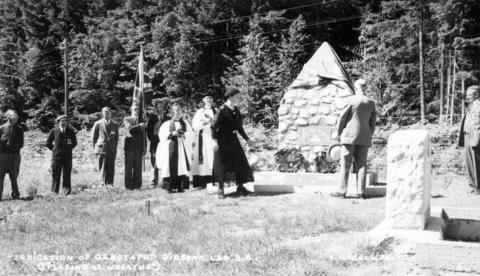 (Last Post)"
Item: CVA 371-1489 - "Dedication of Cenotaph, Gibson's Landing, B.C. (Placing of Wreath)"
Item: CVA 371-1490 - "Dedication of Cenotaph, Gibson's Landing, B.C." Item: CVA 371-2925 - "English Bay in a Temper"
Item: CVA 371-2990 - "God Save the King" Coronation Day Vancouver, B.C. Item : CVA 371-1490 - "Dedication of Cenotaph, Gibson's Landing, B.C." "Dedication of Cenotaph, Gibson's Landing, B.C."